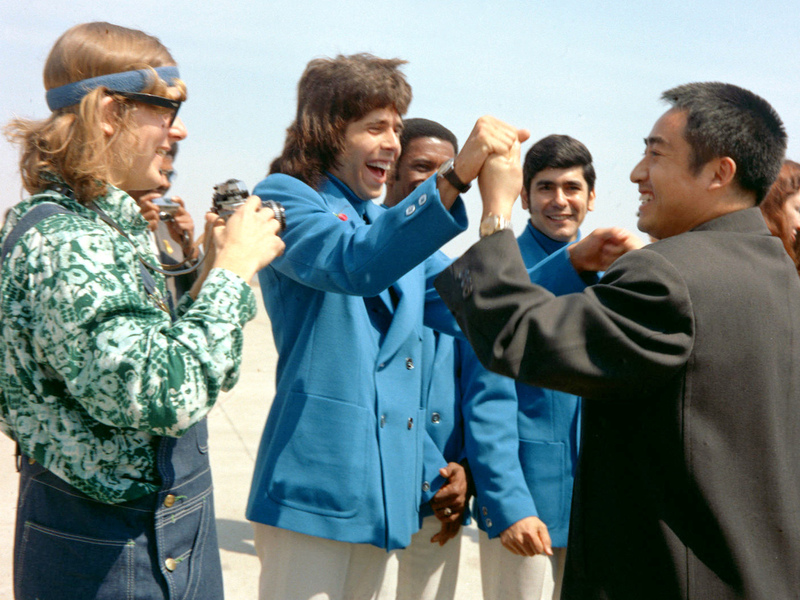 Chinese 'Pingpong Diplomacy' Player Dies : The Two-Way Zhuang Zedong's gift to an American table tennis player paved the way for President Nixon's groundbreaking visit to China. Zhuang was 73. In this photo taken in April 1972 and released by China's Xinhua News Agency, Zhuang Zedong, right, shakes hands with U.S. table tennis player Glenn Cowan during a visit to the U.S. Zhuang, a key figure in 1971's groundbreaking "pingpong diplomacy" between China and the U.S., died in Beijing on Sunday. He was 72. The Chinese table tennis player who was instrumental in the pingpong diplomacy that paved the way for President Nixon's groundbreaking visit to China has died. Zhuang Zedong was 73. "The incident that triggered the invitation to the US table tennis team to visit China took place at the world championships in Nagoya, Japan, when [American table tennis player Glenn] Cowan missed his team's bus and was given a ride on the Chinese bus. "In an interview with Reuters in 2007, Zhuang said his team mates had urged him not to approach the American, but he ignored them. "Through an interpreter he told Cowan: 'Although the US government is unfriendly to China, the American people are friends of the Chinese. I give you this [a silk portrait] to mark the friendship from Chinese people to the American people.'" Zhuang, a three-time world champion, was a major sporting figure in China. Photographs of him with Cowan created a stir because of poor relations between their two countries. Following the incident, Chinese leader Mao Zedong ordered the 15-member American team to be invited to China. Nixon was in China less that a year later, a visit that led to diplomatic ties in 1979. "Zhuang became a favorite of Mao's wife, Jiang Qing, a member of the notorious Gang of Four, which held sway over China's cultural scene during the radical 1966-76 Cultural Revolution. Jiang appointed Zhuang to a number of political posts in the sports ministry. "Zhuang came under investigation after the Gang was deposed and Jiang imprisoned following Mao's death in 1976, and subsequently spent years coaching the provincial team in the northern province of Shanxi. He returned to Beijing in 1985 and coached young players for several years. "Zhuang was married twice and had one daughter." Zhuang, who died Sunday, had fought cancer since 2008.